Valdosta, Ga., Sept. 26. 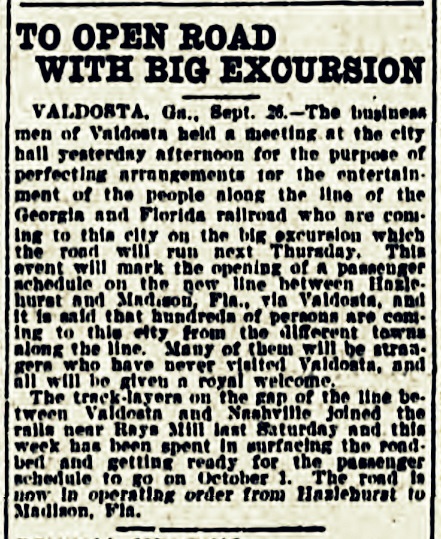 – The businessmen of Valdosta held a meeting at the city hall yesterday afternoon for the purpose of perfecting arrangements for the entertainment of the people along the line of the Georgia and Florida railroad who are coming to this city on the big excursion which the road will run next Thursday. This event will mark the opening of a passenger schedule on the new line between Hazlehurst and Madison, Fla., via Valdosta, and it is said that hundreds of persons are coming to this city from the different towns along the line. Many of them will be strangers who have never visited Valdosta, and all will be given a royal welcome. The track-layers on the gap of the line between Valdosta and Nashville joined the rails near Rays Mill last Saturday and this week has been spent in surfacing the roadbed and getting ready for the passenger schedule to go on October 1. The road is now in operating order from Hazlehurst to Madison, Fla. It Will Arrive From Hazlehurst Next Wednesday with Five Hundred Excursionists to Spend the Day in Valdosta – Crowd Will be Entertained Here. The first regular passenger train over the Georgia and Florida railroad will reach this city next Wednesday at noon from Hazelhurst, Ga. The train will leave Hazlehurst that morning at seven o’clock and it will come through by Broxton, Douglas, Willacoochee, Nashville and other places, taking up a crowd of people at each station and bring them to Valdosta to spend the day. The first train will be devoted exclusively to the white people and the officials of the road are working up the crowd to come here. It will consist of the best class of people between here and Hazlehurst, and the citizens of Valdosta have already decided to arrange some line of entertainment for the visitors. A meeting will be held tonight to take up the matter and discuss what line of entertainment shall be arranged. It has been suggested that open-house be kept for the visitors and that lunches be prepared and served to them. One suggestion was to tag every guest with a badge, which should admit him to the place where refreshments are to be served. Another suggestion was to have the dinner prepared when the guests arrive and serve it to the visitors in a bunch, so that the citizens of Valdosta will have a better opportunity to meet them and talk with them. The details of the entertainment will be arranged later, it having already been decided to make it all that it should be. Valdosta never lags when a test of hospitality comes and every citizen will do his part toward welcoming to the city the people on the line of road above here. It is very probable that the meeting tonight will decide all about what kind of entertainment will be given the visitors.